Rahimi, D., Salahshour, F. (2014). Estimation of Water Requirement, Evaporation and Potential Transpiration of Brassica Napus L Plant in Ahwaz Town Using CROWPWAT Model. International Journal of Advanced Biological and Biomedical Research, 2(4), 1377-1387. Dariush Rahimi; Fariba Salahshour. "Estimation of Water Requirement, Evaporation and Potential Transpiration of Brassica Napus L Plant in Ahwaz Town Using CROWPWAT Model". 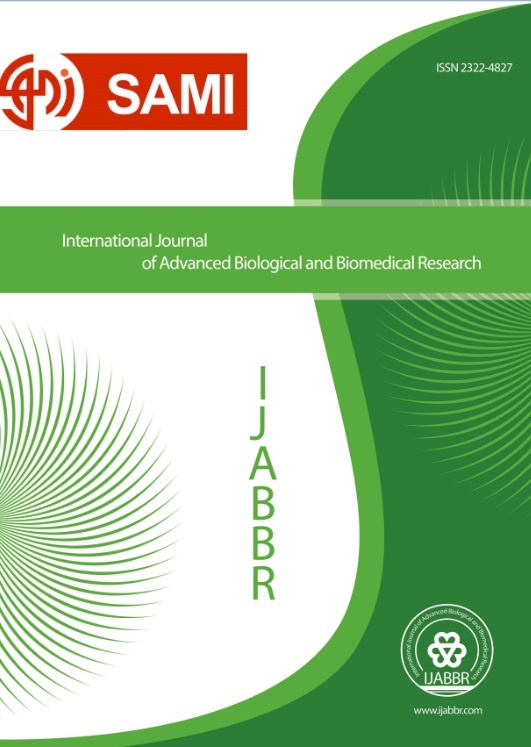 International Journal of Advanced Biological and Biomedical Research, 2, 4, 2014, 1377-1387. Rahimi, D., Salahshour, F. (2014). 'Estimation of Water Requirement, Evaporation and Potential Transpiration of Brassica Napus L Plant in Ahwaz Town Using CROWPWAT Model', International Journal of Advanced Biological and Biomedical Research, 2(4), pp. 1377-1387. Rahimi, D., Salahshour, F. Estimation of Water Requirement, Evaporation and Potential Transpiration of Brassica Napus L Plant in Ahwaz Town Using CROWPWAT Model. International Journal of Advanced Biological and Biomedical Research, 2014; 2(4): 1377-1387. In present world, inequality and uncertainty is high in section of agriculture production and food security of a great amount of people in developing countries is not supplied. Based on studies of international organizations, about a third of produced food for human consumption in worldwide is lost or wasted. While in developing countries, there is price enhancement, decrease in access to healthy food and unhealthy nutrition of a great number of people due to weak infrastructure such as weak in food storage process and package method. Therefore, investment in agriculture sector is too important. We can help to food security by investment in agriculture sector and support and development of education and health in community so all the world can be beneficial. In this research, at the first, ecologic data (temperature and rainfall, sunshine hours, wind speed, relative humidity) are used using a 54 years long term average from 1951-2005 to estimating amount of evaporation and transpiration and water requirement of Brassica napus L for Ahwaz town. Then dry and wet durations were determined for the station. In addition, dry duration in this area, which takes a long from early spring to mid autumn, is accommodated with time of crop growth and its sensitivity to water shortage, hence, complementary irrigation is needed in this time of the year. Then, we calculated real transpiration and evaporation of Brassica napus L crop and water requirement and irrigation of this important crop in studied area using CROPWAT model. For this purpose, ecologic data average (maximum and minimum of temperature, monthly rainfall, wind speed, relative humidity and daily sunshine), crop cultivation pattern (implant date, coefficient amount of each stage of growth days, depth of root, depth of penetration), soil type, total accessible humidity, early humidity of the soil (in percentage from total humidity) and others are inserted in the model. Its results in each stage are presented as graphs and diagrams. Finally, based on these diagrams and graphs, the amount of net irrigation is estimated 2117.4 mm and amount of gross irrigation is estimated 1482.2 mm.